Kitchens that look a little run-down but don’t need to be completely replaced – that’s the market niche Kitchen Tune-Up serves. And that Gazette article? It was exactly the sort of buzz Jill Hansen, Kitchen Tune-Up’s PR specialist was aiming to earn when she first began tapping PRWeb this past summer. The South Dakota-based company recently jettisoned its e-mail marketing campaigns, because as Hansen explains, the campaigns were slow to produce results, and harder to track at that. So Kitchen Tune-Up eliminated their outside marketing help, took their online marketing efforts in-house and gave PRWeb a shot, sending out a handful of releases through the summer. 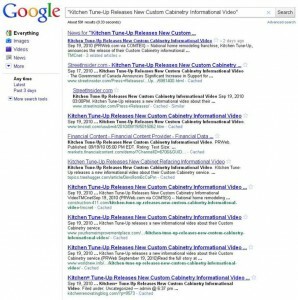 The topics of these releases varied from quick kitchen fixing tips for consumers to human interest stories to franchise opportunity announcements. Hansen found PRWeb to be inexpensive, effective and most importantly she was able to track results effectively. The results exceeded the company’s expectations – from nothing to being featured in local broadcast television news, radio and major daily newspapers like the San Antonio Express-News (along with six other papers in Texas). In one case, Kitchen Tune-Up was featured in Military Edge magazine after modeling a program to give 10 free franchises to honorably discharged veterans. Trade magazines too have turned to Kitchen Tune-Up as a source of content for their publication. The publication now calls Hansen on a regular basis looking for the latest announcements and wanting to get an early jump on what’s new. This is more than just buzz – it’s relationship building! In a few words – video and social media are next. Like many small businesses, the company is experimenting with Twitter and Facebook and believes that incorporating videos into their releases will increase the visibility of their online news releases.